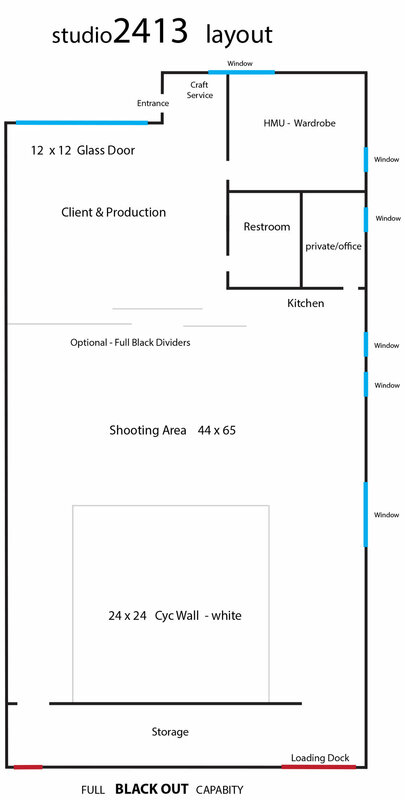 Studio.2413 has 3,000 square feet of space with a completely open floor plan for large shoots. The 24 x 24' Cyc wall space and 44 x 65' shooting area can be blocked off from the front area with optional full black dividers. The space full black-out capability or bright daylight shooting. The hair and make-up/wardrobe room has a full-length mirror and a vanity with a 3 x 4' mirror.